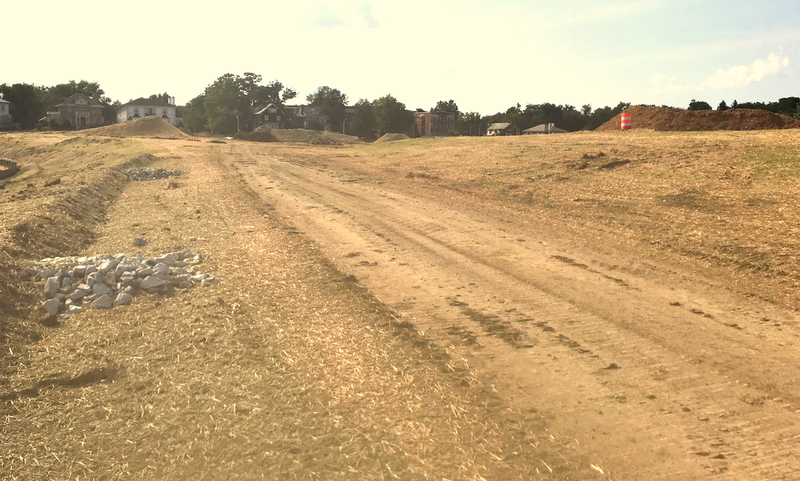 Faced with a citizen rebellion over the clear-cutting of a park, potentially heavy fines for dumping tainted water into the Jones Falls and closure of a polluted reservoir – the Baltimore Department of Public Works has clammed up, refusing to answer questions, while offering tepid apologies at small forums. “We do the best we can and we try to make the best choices we can, and then adjust as we go along,” said Lauren Swiecicki, speaking to a handful of people at the Ashburton Filtration Plant. Repeatedly, she said she was “not sure” or would “have to get back to you” when questioned by Councilman Leon F. Pinkett III. But some clues as to how far the $134 million project has veered off course came from the carefully worded responses of two consultants. DPW heavily depends on consultants – with Whitman, Requardt & Associates, Rummel, Klepper & Kahl (RR&K), Hazen & Sawyer, and Johnson, Mirmiran & Thompson heading the list – to provide construction management services to the agency. “We do the best we can . . . and then adjust as we go along” – DPW Construction Chief Lauren Swiecicki. Karen Moran, senior vice president at Whitman, Requardt, said Druid Lake’s closing last January was the “end point” of a series of contingencies planned by the consultants if construction to install two underground water tanks went awry. “Not that you’d want to do it in the long-term. But for short periods of time, you can operate the system with Druid Lake offline,” she said. “We did not go in and say, ‘Let’s go shut this thing down.’ We always understood there was a possibility, but that was not part of the job that we wanted to happen,” P. Michael Schultz, a RK&K consultant on the project, added. A key factor was DPW’s gamble – endorsed by the consultants – that it could construct a cofferdam across the lake while not stirring up bottom sediment. Moran said that it was agreed that “turbidity curtains” would keep sediment churned up by the cofferdam away from drinking water destined for hundreds of thousands of Baltimore City and Baltimore County residents. 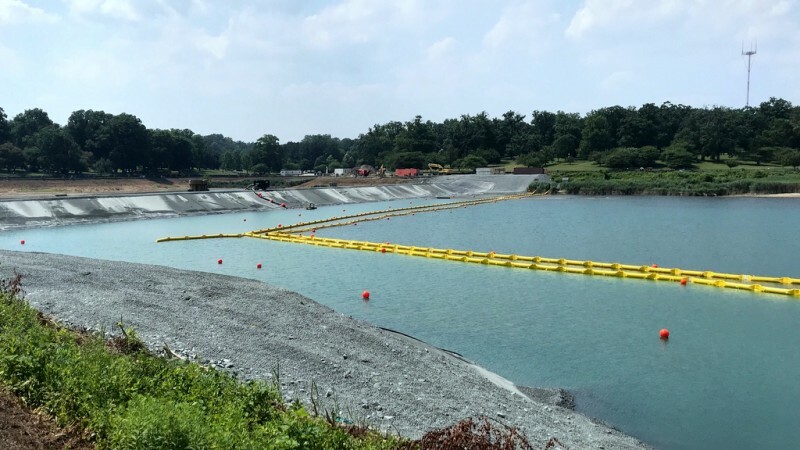 As the contractor, Oscar Renda, began dumping 100,000 tons of riprap and surge stone into the lake to form the cofferdam, “turbidity,” or sediment, skyrocketed on the drinking side of the lake. “There is a gap at the bottom of that turbidity curtain,” Moran said last week in what was the first public explanation of how things went wrong. “And the particulates were finer than we expected. So they started to migrate” into the drinking water. “The particulates were finer than we expected. So they started to migrate” – DPW consultant Karen Moran. After two months of releasing the lake’s water into the public water system, then shutting it down, DPW placed the lake “offline” in early January. The action removed 200 million gallons of drinking water from the region’s supply. Druid Lake remains “offline” as DPW attempts to drain off the turbid water and introduce fresh water to lower the lake’s sediment to a safe level. Swiecicki and the consultants said public health was never endangered during last fall’s period of on-and-off service. They also insist that enough water can be processed without Druid Lake’s storage capacity that the 1.8 million people who use Baltimore’s water will not be short of safe drinking water in the future. Asked by Pinkett if the turbidity curtain was installed properly, Schultz would not answer. “Typically they do not go to the bottom, but they can,” he said. The same contractor was faulted last week by irate residents of Ashburton for clear-cutting 198 trees at Hanlon Park to make way for another water tank project managed by DPW. 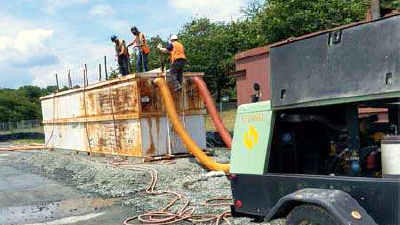 Problems at the Druid Lake project only escalated when inspectors from the Maryland Department of the Environment discovered that highly chlorinated water was being dumped into the Jones Falls. A July 17 MDE inspection report, obtained by The Brew, states that water was not adequately treated before it was discharged into storm drains that emptied into the Jones Falls below the 28th Street Bridge. The “dewatering” operation started last September and apparently involved more than 100 million gallons of chlorinated water. 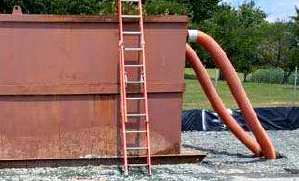 While dumping the water, DPW failed to submit quarterly monitoring reports to MDE as required by law. Such violations have resulted in sizable fines in similar cases involving private contractors. 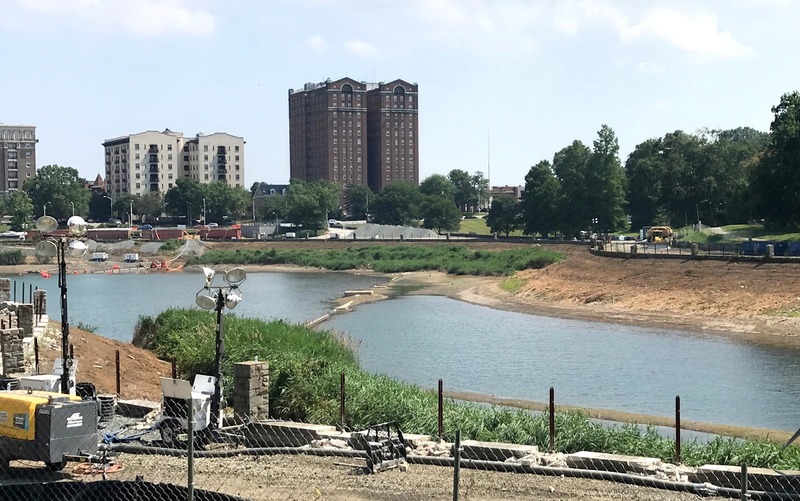 The Druid Lake discharges are still under investigation, MDE spokesman Jay Apperson said, and the agency has not yet determined whether fines will be assessed against Baltimore. Similar clean water violations have resulted in sizable fines. She said that DPW’s own inspectors had always found the chlorine levels to be within acceptable levels. One possible explanation for that: DPW measured the dumped water with a non-compliant chlorine test kit, according to violation 4 of the state inspection report below. Excerpt from MDE’s inspection report citing the city’s violation of TRC (total residual chlorine) discharge levels at Druid Lake. 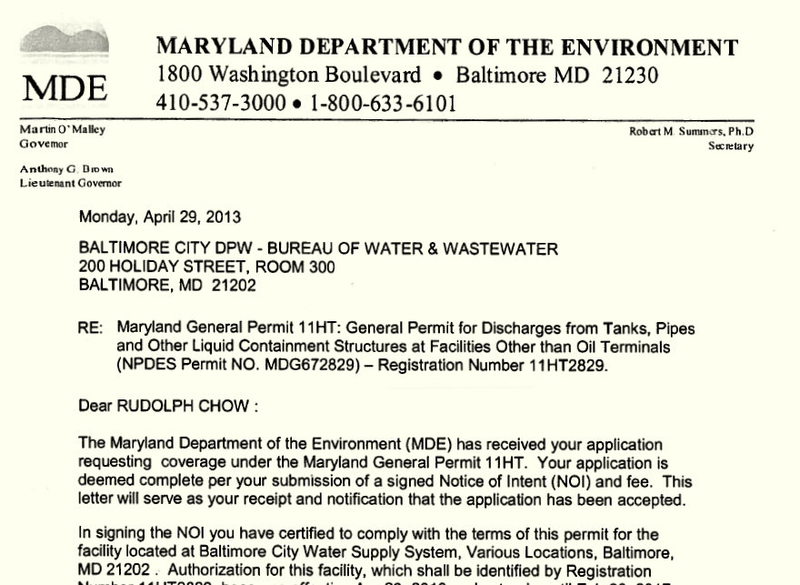 BELOW: The permit granted to the city to discharge liquids into public waterways under clean water standards.